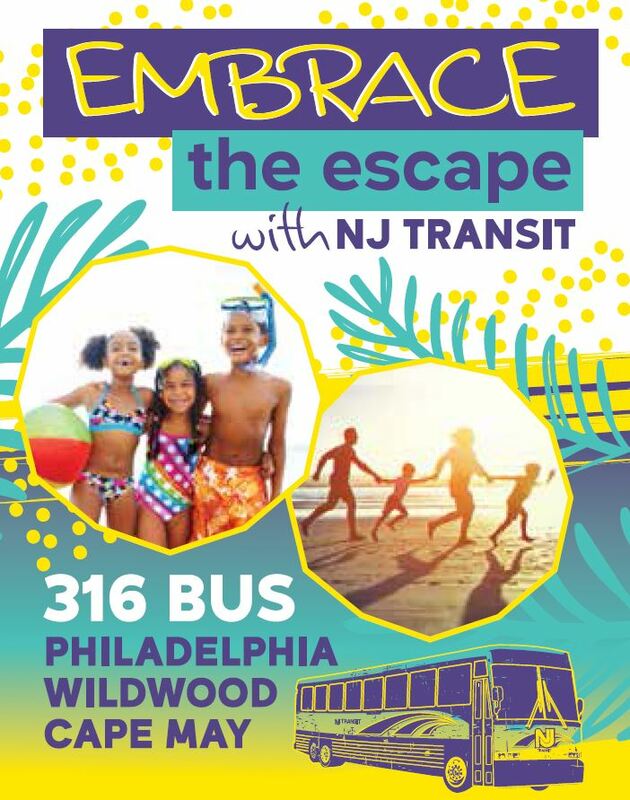 NJ TRANSIT Summer Service, with Direct Routes to Shore Points! NJ TRANSIT operates over 40 bus routes in southern NJ. To see if your location is served by a bus route click here click here. To view NJ TRANSIT bus schedules click here. Southern NJ is served by several bus providers including NJ TRANSIT which provides fixed route bus services for the general public and smaller, localized bus services for the general public, senior citizens and people with disabilities. Generally, the smaller bus services are demand responsive, meaning they provide door-to door-service. Some bus providers charge a fare; others are free but appreciate donations to cover rapidly increasing expenses. The NJ TRANSIT Mobile App puts everything within your reach anytime, anywhere. Conveniently get the vital information on your mobile device. Enjoy the flexibility of everything you need to plan and travel with NJ TRANSIT in one place. NJ TRANSIT operates over 40 bus routes in southern NJ. To see if your location is served by a bus route click the image above. In urban areas, bus stops are usually marked by bus stop signs. Signs may list the route numbers of the buses stopping at that location. Be sure to check the route and destination of the bus you want to take on both the bus stop sign and on the bus. In rural and suburban areas, where stops may not be marked, you can board a bus anywhere along the route if it is safe for the bus to stop. To hail a bus, simply signal to the driver as the bus approaches. When you board, tell the driver where you are going and deposit the required fare. Most local buses require exact change in coins or $1 bills. The bus driver does not carry money and cannot make change! When you are near your exit stop, alert the bus driver by pressing the signal tape above and between the side windows. How to Read a Bus Timetable? Choose your direction of travel and look at the section of the schedule for either weekdays (Monday thru Friday) or weekends (Saturdays, Sundays, and holidays). Find the location you are starting from on the timetable. “Time points” listed represent the major stops. Buses also stop at locations along the route that are between the time points. One-zone intrastate trip $1.50 Children / Senior Citizens / Persons with Disabilities $ .65 County and local services for seniors & disabled Get more fare information here. View NJ TRANSIT ticket vendors by county (tickets also available through rail terminals and bus terminals). NJ TRANSIT bus fares are based on the number of zones traveled between your origin and destination. The fare for a one-zone intrastate trip is $1.50 ($.70 for seniors/persons with disabilities/children). Additional zone charges may apply for longer trips. Most trips in southern NJ are four zones or less. Most local buses require exact change in coins or $1 bills. The bus driver does not carry money and cannot make change. If you commute daily, you can save up to 35% over the regular one-way fare by purchasing a monthly NJ TRANSIT bus pass. You can use it to make unlimited trips on NJ TRANSIT bus routes for an entire calendar month for the number of zones indicated on the pass. If you travel only a few days a week, a 10-trip ticket is available at 10-25% discount over the regular one-way fare. It is good for ten one-way trips for 20 days from the date of purchase. If your trip requires a transfer to a second bus, purchase a transfer for $.60 ($.25 for seniors/persons with disabilities/children) when you pay your fare on the first bus—you’ll save $.70 cents on the second fare! Quick-Tik® Program Quik-Tik® is the fast, easy way to buy your monthly NJ TRANSIT pass. Quik-Tik® is a great alternative to purchasing your monthly pass from ticket vending machines or ticket agents. And, with Quik-Tik® you get the same cost savings of up to 33% off regular peak one-way fares. Services for Persons with Disabilities Access Link is a public transportation service developed to comply with the paratransit regulations of the ADA and is for people with disabilities who are unable to use the local NJ TRANSIT fixed route bus service. In order to use Access Link, you must first apply for eligibility and reservations are required. Access Link service is comparable to the bus in that it is a curb to curb service, charges a fare and is available during the same days and hours as the regularly scheduled local fixed route bus service, including weekends and holidays. If there is NJ TRANSIT bus service available, Access Link service will be available. If there is no NJ TRANSIT bus service, Access Link will not be available. For more information, call 1-800-955-2321 or visit www.njtransit.com. The SEPTA system provides public bus, trolley, subway and rail services in southeastern PA, including the counties of Bucks, Chester, Delaware, Montgomery and Philadelphia. Several NJ TRANSIT bus routes connect with SEPTA bus and rail services in downtown Philadelphia. For more information call 215- 580-7800 or visit www.septa.org. SEN-HAN Transit provides coordinated special transportation services to elderly and disabled persons in Camden County. Service is provided for non-emergency medical, shopping, veterans’ services, post-secondary education and special events trips. Trips are also provided to Camden County residents with disabilities to competitive work sites and employment support services in the county. For more information, call 856-456-3344 or visit www.scucs.org. Most counties in New Jersey operate community paratransit services which supplement NJ TRANSIT bus and rail services by providing more flexible transportation options. Many of these services require advance reservations, have eligibility criteria and may be restricted to senior citizens, people with disabilities and/or social services clients. For information on eligibility criteria and operating hours or to schedule a ride, please contact the listed transit providers. The Atlantic County Transportation Unit provides transportation services to qualified senior citizens and people with disabilities who reside in Atlantic County. For more information, call (609) 645-5910 or click here. Shuttle Service running along English Creek Road and Tilton Falls Road with connecting transfers to NJ TRANSIT bus service. Conveniently reach your employment, shopping, medical and social service destinations. To veiw the shuttle’s schedule Click here! Click here for more information and a detailed map of the route. Pureland North-South Shuttle Schedule. A free deviated route shuttle serving Camden City, Westville, Woodbury, and the Pureland Industrial Complex. The Cumberland County Office of Employment and Training operates four bus routes serving employment locations in the Bridgeton and Vineland areas. For more information, call (856) 451-8920; ext. 116 or visithttp://www.co.cumberland.nj.us. A New Shuttle Serving: Avandale Park & Ride, Williamstown, Glassboro, Mullica Hill, Swedesboro, and the Pureland Industrial Complex. Many towns provide bus services for their residents. Some will transport any resident; others may be limited to senior citizens and persons with disabilities. Travel is usually restricted to within the town and trip destinations and days and hours of operation vary within each town. For more information, contact your municipal clerk’s office. For more information or to have schedules mailed to you, call us at (856) 596-8228.